The bottom of line of real climate change is that it is being censored and distorted in the news. 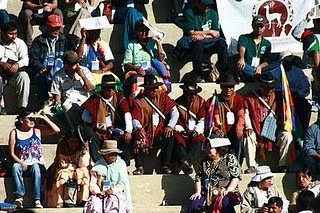 I've been busy trying to give away articles on the Native American delegations to the Bolivia Climate Conference. As far as I can tell, none of the newspapers in and around Indian country have published the articles. This is unusual. Normally newspapers are anxious to publish articles on local people involved in newsworthy events, especially when they have been working diligently with Bolivian President Evo Morales. There is a reason to take note of this. In the United States, Indian Nations are financially dependent on gouging out Mother Earth's liver for coal and power plants and depleting natural resources for other exploitative industries. The words, "Climate Debt" and "International Climate Court of Justice," have rattled the cages of the governments and corporate polluters of the world. An alarm was set off around the world when the Declaration on the Rights of Mother Earth was announced, with a new vision of legal rights for Mother Earth. Mining companies, including those assassinating activists in Central and South America, surely took notice, especially in Canada were the majority of the most vicious mining companies are based. The voices of Navajos in Cochabamba speaking out against the Navajo Nation's longtime abuse of the land and disregard for the health of the Navajo people, is in direct contrast to the elected Navajo leaders who profess to be living in harmony with Mother Earth and defending human rights. Further, the condemnation of REDD has shaken the exploiters who want to use the hoax of carbon credits to seize Indigenous forests and allow global corporate polluters to continue their crimes. Many editors will blacklist a writer who dares quote President Morales speaking out against capitalism and economies based on militaries and bloodshed. Most editors refuse to examine the United States reasons for the wars in Iraq and Afghanistan. Instead, the newspapers publish blind promotions of war, leading to more recruitments of people of color and more deaths. Buffy Sainte Marie exposed the relationship between speaking out against US wars and becoming blacklisted. Buffy revealed that she was forced out of the music industry in the United States by President Lyndon Johnson, after she wrote "Universal Soldier" during the Vietnam War. It couldn't have been easier for journalists to write articles on the Bolivia Climate Conference. There were video interviews with Native delegations broadcast on the spot by Govinda at Earthcycles http://www.earthcycles.net/ Also, IEN, Dooda Desert Rock and others released press statements. Ben Powless, Mohawk at IEN, offered his great photos. There should have been articles on the powerful delegations from the Indigenous Environmental Network, Alaska InterTribal Council, First Nations and Mohawks. One delegation of grassroots activists included Timbisha Chairman Joe Kennedy; Western Shoshone activist Carrie Dann; Elouise Brown, Navajo director of Dooda Desert Rock; Jose Matus, Yaqui, director of the Indigenous Alliance without Borders; Navajo youth and Fulbright scholar Michelle Cook arriving from New Zealand and Chibon Everstz, Mohawk youth. They were joined by individuals from many Indian Nations, including Lakota from Pine Ridge and Oneida from New York. Alaskan Native Faith Gemmill opened the conference with President Morales. Ofelia Rivas, O'odham, and Manny Pino, Acoma Pueblo, served as cochairs of the vital working group on the Rights of Indigenous Peoples, among the most powerful of the 17 working groups. The conference culminated with the Peoples Agreement and new climate goals, the Declaration on the Rights of Indigenous Peoples for the protection of lands and peoples, the Declaration on the Rights of Mother Earth and other powerful statements. The following article published by Americas Program reveals some of the highlights of the Native delegations, "Indigenous at Climate Conference Design Roadmap to a New World."